The Tombstone Thunderbird is one of the better monster stories of the Wild West, thanks to the fact that it originated in a story published in the Tombstone Epitaph on April 26, 1890. I could go ahead and summarize the story, but that takes away much of the distinctive flavor of the original telling, so I shall simply reproduce it. After the first shock of wild amazement as it passed the two men, who were on horseback and armed with Winchester rifles, regained sufficient courage to pursue the monster and after an exciting chase of several miles succeeded in getting near enough to open fire with their rifles and wounding it. The creature then turned on the men but owing to its exhausted condition they were able to keep out of its way and after a few well directed shots the monster partly rolled over and remained motionless. The men cautiously approached, their horses snorting in terror and found that the monster was dead. 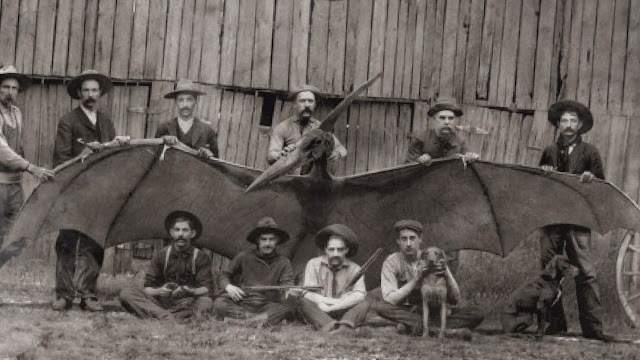 They then proceeded to make an examination and found that it measured about ninety two feet in length and the greatest diameter was about fifty inches The monster had only two feet, these being situated a short distance from where the wings were joined to the body. The head, as near as they could judge was about eight feet long, the jaws being thickly set with strong, sharp teeth. It’s eyes were as large as a dinner plate and protruded halfway from the head. They had some difficulty in measuring the wings as they were partly folded under the body, but finally got one straightened out sufficiently to obtain a measurement of seventy-eight feet, making the total length from tip to tip about 160 feet. The wings were composed of a thick and nearly transparent membrane and were devoid of feathers or hair, as was the entire body. The skin of the body was comparatively smooth and easily penetrated by a bullet The men cut off a small portion of the tip of one wing and took it home with them. Late last night one of them arrived in this city for supplies and to make the necessary preparations to skin the creature, when the hide will be sent east for examination by the eminent scientists of the day. It is likely this original story was a tall tale, which were popular newspaper pranks of the day, although the story was picked up and printed elsewhere, including in the Omaha World Herald. The Tombstone Epitaph doesn't seem to have followed up on the story in any way, which lends credibility to the possibility of it being a prank. There are reports of a photo of the monster, and sometimes images will show up purporting to be that photo, including the one at the top of this story. The claims of a photograph seem to date from a Saga Magazine article from 1963, in which a writer named Jack Pearl claimed that the Tombstone Epitaph had "published a photograph of a huge bird nailed to a wall. The newspaper said that it had been shot by two prospectors and hauled into town by wagon. Lined up in front of the bird were six grown men with their arms outstretched, fingertip to fingertip. The creature measured about 36 feet from wingtip to wingtip." No such photo had been published, and later articles insisted the photo had been published in newspapers throughout the country. Indeed, aficionados of Western history insisted that they had seen these photos, reproduced in books or existing as photocopies in historical societies. It is possible this is an example of mass confabulation, in which a large group of people share an invented memory. There are a number of examples of this, including the largely held misconception that Nelson Mandela died while in prison in South Africa (it is likely he is being conflated with murdered South African activist Steve Biko), but this misapprehension is so common that examples of mass confabulation are sometimes called the Mandela Effect. It is also possible that people are remembering related images, such as a scene in the 1969 film "Valley of Gwangi" in which a cowboy battles a pterodactyl, or a popularly reproduced image of standing in front of a recreated Argentavis magnificens at the Natural History Museum of Los Angeles, a bird with a 25-foot wingspan. Or there is another possibility. It is possible cowboys killed a giant bird or dinosaur near Tombstone in 1890 and there is a lost photograph of it somewhere. This is probably the less likely option, but it's the more interesting option, and so is the one I prefer.